A mum has sparked controversy after sharing her lengthy list of requirements she wants in a babysitter for her children. The list, comprising of 14 points, was shared by the mum in a Facebook post and later shared on Reddit. Among the requirements, candidates need to have a ‘bachelors degree in childcare’ or nine years experience, as well as being willing to pay for their snacks. ‘Have a bachelors degree in childcare OR nine years of relevant babysitting experience. ‘3 good references with phone numbers. ‘Full time availability inc. weekends. ‘Your own car and driving licence. ‘Native English speaking and preferred second language to teach my children. ‘CPR certified. Ideally a CNA licence. ‘NO history of traffic tickets and NO problems with the law (I will be running your name thru databases). ‘No tattoos. No drugs. No alcohol. No sketchy social media behaviour AND/OR public pictures. ‘MUST be okay with my two pitbulls. ‘MUST be okay with emergency last minute calls. ‘Willing to pay for some snacks. 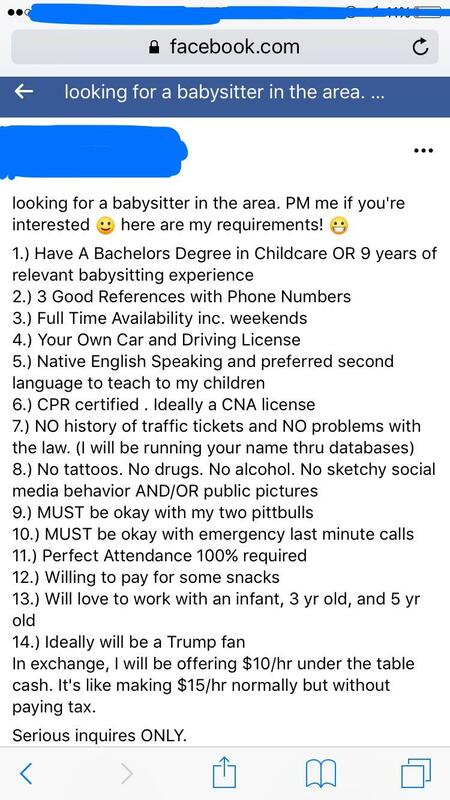 ‘Will love to work with an infant, 3 yr old, and 5 yr old. ‘In exchange I will be offering $10/hr under the table cash. It’s like paying $15/hr normally but without paying tax.